Manchester United close to extending David de Gea's contract? Manchester United are reportedly edging closer to securing the long-term future of goalkeeper David de Gea despite their struggles in the Premier League this term. The Spain international has been in a contract standoff with the Red Devils over the past year and reports previously indicated that the shot-stopper may only pen an extension, should United seal a top-four spot this season. However, according to The Sun, that does not appear the case any longer and the Spaniard has told his close friends that he is on the cusp of extending his deal with the club. 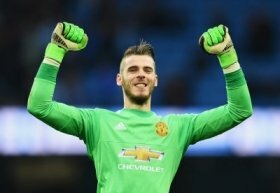 It is added that the 28-year-old will become the highest-paid goalkeeper in the world with a salary package of £400,000-a-week after bonuses, making him stand behind only Alexis Sanchez at the Old Trafford outfit. De Gea's current deal was initially due to expire at the end of the season but United are deemed to have triggered an extension clause to prolong his stay until the end of the 2019/2020 campaign.